Do you want to look and feel better than you have in the last decade? Definitely. I want my energy back, and I want to feel more confident about the way I look in my clothes. Have you tried the "rapid fat loss" programs in the past? Yes. They don’t work. They’re too restrictive, and the results don’t last. Have you tried joining a gym to do it on your own? Yes, but I can't seem to stay consistently motivated to get there 3-4x/week. Do you have some level of apprehension about which exercises you should be doing? Yes. I’m not sure which exercises are the best for reaching my goal. Have you tried a class at the local YMCA or nearby bootcamp, only to realize that the workouts just aren't the right fit? Yes. They’re either too difficult and cause previous injuries to flare up or they’re way too easy and not at the pace I need. Do you know, deep down, that it will take more than just a couple of fitness classes per week to make the transformation that you dream of? Yes. I know it will take a specific plan for both my exercise and nutrition, done consistently for a while, in order to make a difference. Do you realize that "eating healthy" is also important when it comes to achieving fitness goals? Yes. But I can't exactly figure out what "healthy eating" means for me. Do you have trouble making healthy eating a part of your lifestyle for more than a few days or a week? Yes. I’m good during the work week but I have a really hard time staying on track at the weekend. Every Monday feels like I’m starting over. Are you a working professional who may also be married or have kids? Yes. I’m very busy adult who needs the most effective and efficient training program possible. Do you need positive motivation and accountability to help remind you of what will help you reach your goals? Yes, I can’t always motivate myself enough to get to the gym or eat well. Have you moved past the goals of "six-pack abs" and getting a bikini body? Yes. I’m more focused on increasing energy, having better posture, more confidence the way I look, feeling better in my own skin, and feeling more happy about my body & life than I have in the past decade. If you answered "yes" to any of these questions, Lucky13Fitness is the place for you. With consideration given to goals, lifestyle, availability & injury or medical history, we cater to each member with a tailor-made fitness programming & nutrition guidance. But, we don't stop there. We also offer all members support as needed via phone calls, emails, text messages, our Private Facebook group, and face-to-face check-ins. We are fully committed to the success of each individual. The premiere offering of Lucky13Fitness, 1:1 training gives the member exclusive access to the entire studio space, and the undivided attention of a certified trainer during the training session. This service is ideal for those who are just getting started in the fitness world and need support learning foundational movement patterns and careful coaching and cueing. Those who have apprehension exercising around other people also enjoy the private environment this service has to offer. These sessions are scheduled by appointment only, as to fit the schedule of the client. The most popular personal training option, this service allows 1 personal trainer to coach up to 4 clients in the same exercise environment. Each client is assessed individually and follows her/his own individualized program, based on assessment results, goals, and fitness level. 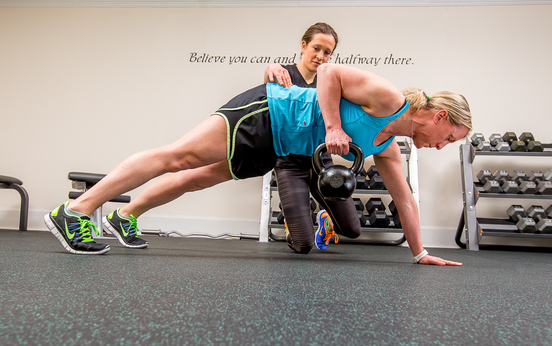 The low trainer-to-client ratio allows for ample 1:1 attention for each client in any session. This offering is ideal for those who have prior experience working out, and have a baseline of understanding about movement patterns. * All Training Monthly Memberships all include one private Coaching call with Lucky13 founder Michelle Densmore. This 30-minute+ individual session addresses other important variables that are crucial to client success and transformation. Topics include: nutrition, stress management/reduction, sleep, work/life balance, as well as answering all questions a client may have. + 60-minute sessions, or in-person sessions available upon request.